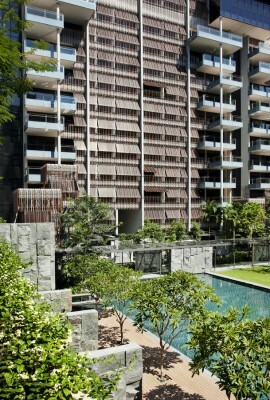 Set amidst an enclave of black and white houses just off the prime Orchard/Scotts Road area, and against a verdant 20-hectare backdrop of greenery, the 210-unit Goodwood Residence is conceived on a macro scale as a breathing space – a rarity in high density urbanised Singapore – and an extension of the Goodwood Hill tree conservation area that it shares a boundary of 150m with. 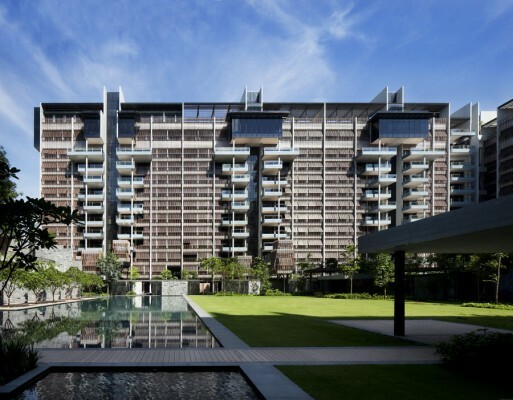 Articulated as two 12-storey L-shaped blocks, the 2.5-hectare development dialogues with the hill that it embraces and merges with in a language of openness and continuity made expressive by varying degrees of scale and privacy. 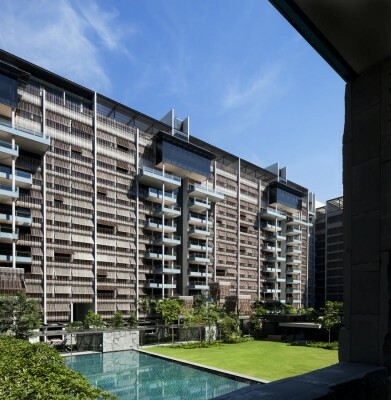 All units are one apartment thick, with the blocks configured like boundary walls that define and enclose a series of courtyards that first draws its residents through an intimately scaled tree-lined boulevard that wraps around a pair of foliage screened tennis courts, leading to a formally scaled cobblestone entrance courtyard featuring a cluster of majestic raintrees, and finally opens out from under the canopies, like a clear forest glade, into an expansive central open lawn/ swimming pool. 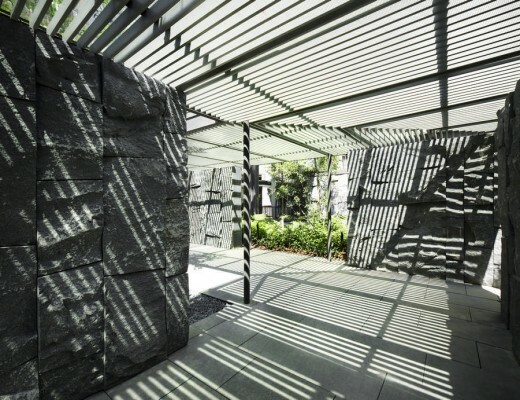 This spacious courtyard that visually merges into Goodwood Hill, measures some 100m across opposite blocks, which enhances the privacy of its residents while offering excellent views towards the lush greenery. It is the main community gathering place and breathing room of the development, complete with club house facilities (concierge, reading lounge, private function room and pools) that parallel that of serviced apartments. Smaller landscaped courtyards branching off the sheltered walkways are further extended into the basement carpark as entry points, making pleasant the homecoming experience with natural day light, fresh air and planting. 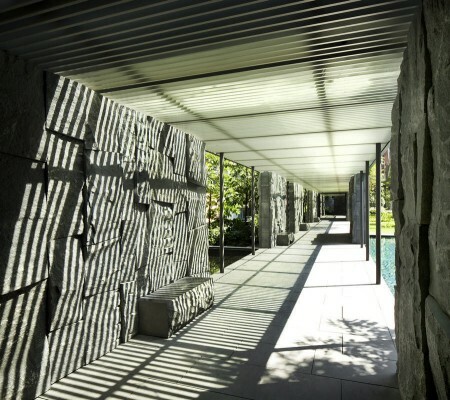 On a building scale, distinct strata of living experiences are crafted. The ground floor units are designed as a new typology of “landed housing apartments”, with lofty ceilings, generous outdoor pool terraces and specially devised auto-sliding gates/garden windows that are a modern interpretation of a traditional haha wall, allowing owners control over the degree of privacy and views out into the central lawn. 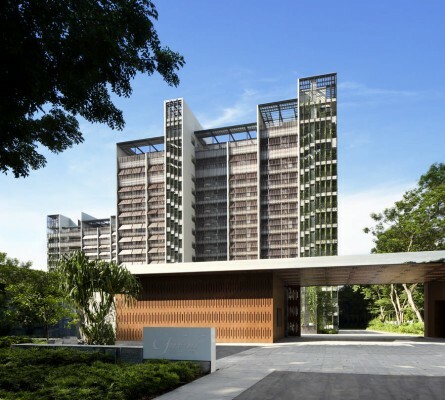 Overlooking the central courtyard on the 2nd and 3rd storeys, are 15 units designed with treehouse cabanas perched amidst the treetop canopies, immersing its inhabitants in close-range nature. Rising above this tree line are the mid-levels (4th-11th storeys), which have overlapping double volume balconies – semi indoor/outdoor spaces reminiscent of the projected drawing studios of the black and white colonial houses from which to fully enjoy the expanse of openness and panoramic views towards Goodwood Hill. This culminates in the 12th storey penthouses that are sky-bungalows complete with generous roof/pool terraces that effectively recreate a new ground level with the added advantage of unobstructed city views and cooling breezes at elevated height. 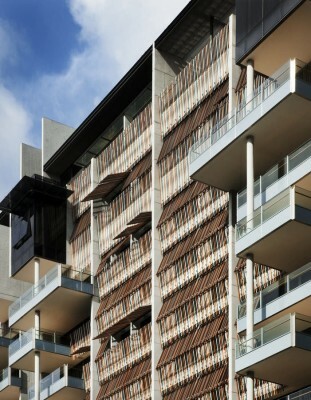 Inspired by patterns of traditional Asian woven textiles and the roll up bamboo chicks of the black and white colonial houses in the vicinity, all typical apartment units (2nd storey upwards) feature fine aluminium fins orientated at 45 degrees to north-south, that are devised as operable façade screens which not only provide vertical sun shading without compromising on ventilation, but also allows user-controlled amounts of privacy as well as facade animation. 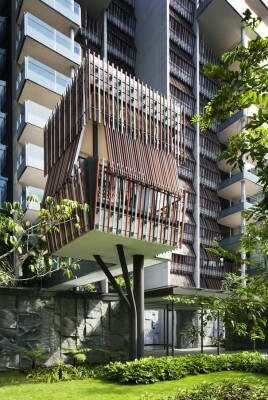 Planters of 1m width, coupled with projecting balconies of either 2.7m or 4.5m depth, further provide vertical greenery and horizontal shading for the apartments below. 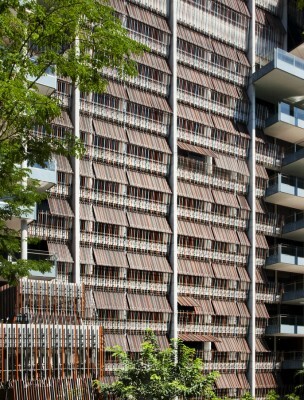 Conceived with sustainable design principles from the very onset, the project showcases several other (below listed) innovative environmental features and demonstrates that the introduction of such green measures, which cost only 1% more in construction cost, need not come at a high premium if adopted early in the design process. The estimated savings from these implementations are approximately $600,000 on annual utility bills for the home and the common areas, which is equivalent to 20% reduction in the monthly maintenance cost. 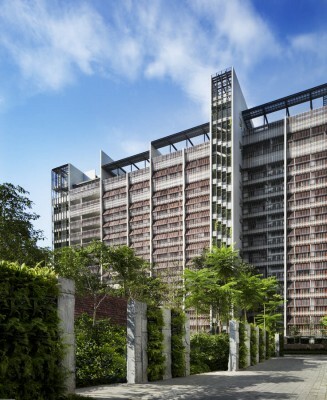 Goodwood Residence has been awarded the prestigious GreenMark Platinum Award by the Building and Construction Authority of Singapore. Complementing and extending the green of Goodwill Hill are 55 existing trees which are preserved, along with approximately 500 new trees that are native to Southeast Asia. 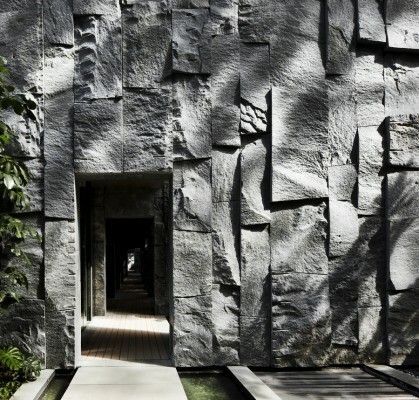 This is reinforced by some 1,700sqm of vertical landscaping and the grand central lawn at the heart of the development. Almost 80% of the estate is dedicated to landscaping and communal facilities. To mimimise the use of potable water, a self-sustaining irrigation system that harvests rainwater, irrigation water run-off and underground water to irrigate the plants during the wet and dry seasons is devised. This is made possible due to the site’s high water table and foothill location. Reed planting beds that act as filters further provide a natural bio-filtration process along the water migration route in order to improve water quality before it is stored for the next cycle of irrigation. Separate refuse chutes for organic waste and recyclable waste are provided side by side at the common service lobbies for the convenience of residents and are connected to a development-wide pneumatic waste system, eliminating the need for multiple refuse collection points within the estate. 100% of the internal walls of Goodwood Residence are built from reclaimed aggregates that originated from the pre-existing building walls and structures.